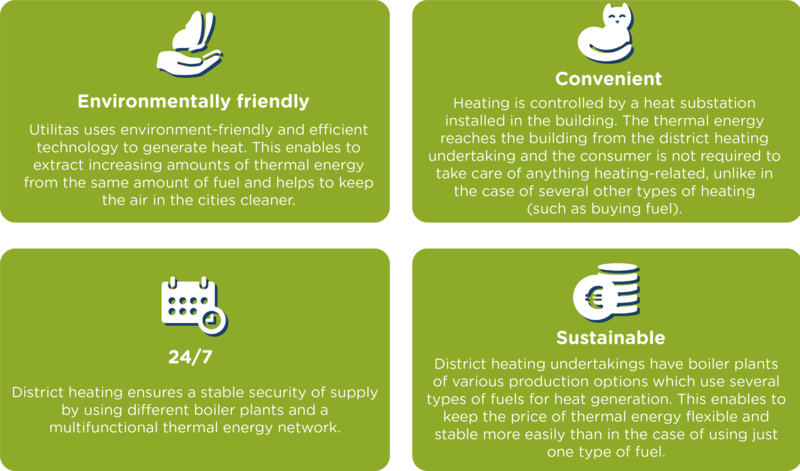 District heating is efficient, environment-friendly, and the best method for supplying thermal energy to densely populated areas. District heating distributes the thermal energy generated by efficient central boiler plants or combined heat and power stations to heat substations via the heat network. Centralized thermal energy generation enables to implement the best possible technology, to select the types of fuel flexibly, and to enjoy the advantages of combined heat and power generation. District heating is the most common type of heating in Estonia, with the share of district heating in the Estonian thermal energy supply amounting to at least 60 percent. It is a convenient type of heating from the consumer’s perspective which ensures security of supply and is environment-friendly. All network areas of Utilitas qualify as efficient district heating areas for the purposes of the Energy Efficiency Directive (2012/27/EU) and use renewable fuels when operating at the base load.